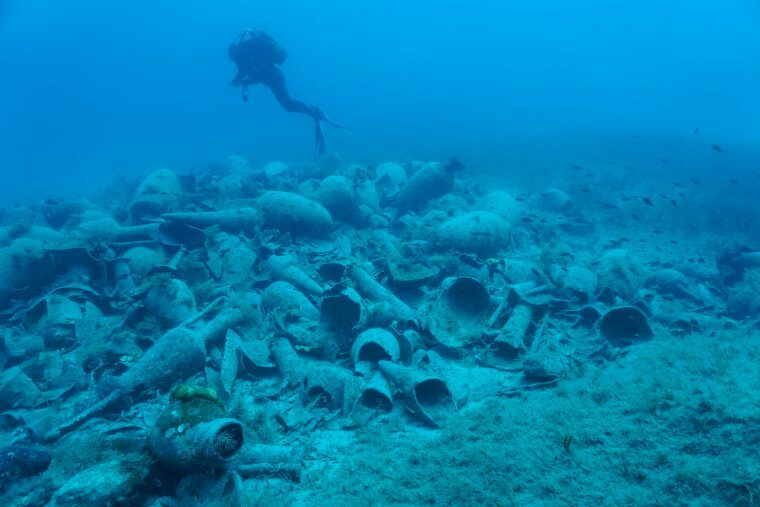 The remains of ancient coastal structures and a port, a large number of shipwrecks dating back to various eras and significant smaller finds were found in underwater archaeological excavations conducted by the Ephorate of Underwater Antiquities at the island of Delos from May 2 until May 20, the Culture and Sports Ministry announced on Monday. “The finds confirm that Delos was an important trading base and an important maritime trade route through the ages, linking the east and west Mediterranean,” a ministry announcement said. According to the ministry, the breakwater was an “impressively strong structure, roughly 160 meters long and at least 40 meters wide, built on a pile of unshaped rocks, while its upper structure was for the great part constructed of granite blocks of impressive size.” The date of its construction remains unknown and further archaeological and geological research will be needed to discover this, it added. The mission also had the opportunity to photograph and map two more shipwrecks found in previous underwater explorations, at Kato Kerenale and near Fournoi. All the shipwrecks found date to the period between the end of the 2nd century and the 1st century B.E.C. when the island was at the height of its prosperity, before it was sacked by Mithridates and the pirates of Cilicia.